The other day I was driving on the interstate and saw something that broke my heart. In the middle of the busy highway, there was a small stuffed animal. My mind went where yours probably just did. Some child has lost that stuffed animal and will be heartbroken when they realize it. I wished that I had seen it happen, so I could track them down and return the animal to the proper owner, but there was nothing I could do. I imagined what it would have been like when my children were younger. They would have cried their hearts out for days. I probably would have too. Imagine you have just gotten off a train. You get your precious little girl in her stroller, and as you do, her favorite stuffed bunny falls out and onto the track. Your first instinct is to get it, but you are warned that another train is coming. You are left with nothing to do but stand by and watch as your daughter’s favorite stuffed bunny is smashed by the oncoming train. What do you do? How do you handle it? How will you explain to the child why you didn’t jump down there and risk your life for her bunny? We, like the bunny, are a treasured creation to God. He made us, formed us, and loves us dearly. However, somehow, we always manage to find some way to wiggle away from Him, like that small stuffed bunny. When we do, we find that we have no life, no voice, no movement without Him. We are simply helpless on the tracks as the train that will destroy us moves closer and closer. The good news is that God, who knows all and sees all, cares for us. You see, the illustration I used above really happened. In Boston a mother got off the train with her little girl. 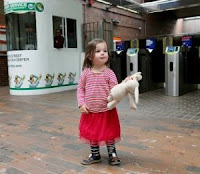 Her bunny fell onto the tracks and the mother had no idea what to do. However, one of the MBTA workers saw the bunny and called the oncoming train, which slowed down so the stuffed bunny could be rescued. The mother was quoted as saying to the Transit Authority, “you really didn't have to do what you did today, but you have made a little 3-year-old incredibly happy." God cares for you. You are His. He will stop everything to get to you. He did not eve consider His own Son, too high a price to pay for your rescue. He loves you dearly. Take rest in knowing that the One who gives you life, the One who loves you more than you can imagine, the One who gave His life for yours, will be your rescue!